Are you paying more for water than gasoline? Bottled water sells for 1,000 times that of tap water. A 16 oz. bottle of water at $1.26 adds up to $5.04 per gallon. Over 90% of the cost of bottled water is the lid, label, and bottle. 86% of used water bottles end up in the landfill or waterways. Every day, 3 million empty bottles go into the trash. There has been a 500% increase in the use of bottled water in the past decade. The only requirement for bottled water is it "be as good" as tap water. Styrofoam will not decompose in your or your children's lifetime. Paper cups are coated with a cancer-causing agent that will not burn safely and is not allowed in most landfills. The Pacific garbage patch is a garbage stew the size of Texas and growing daily off the coast of California. The answer is crystal clear; hospitals, offices, and companies need to stop using Styrofoam and plastic water bottles. 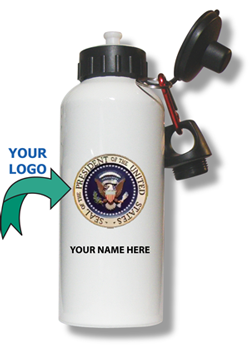 This according to a California company, www.ecomugs.com, which has developed lead-free, plastic-free, Calif. prop 64 compliant ecomugs and bottles that can be ordered in quantities as low as one, all with a company logo and employee name. Company founder Kirk Meyer said, "When we started adding the employee's name, we found that they were actually remembering their bottle at lunch and contributing to a viral market for their company logo."